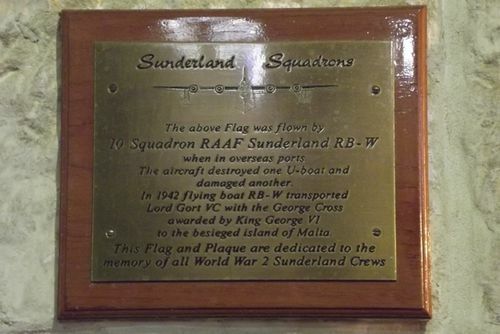 Flag and plaque are dedicated to the memory of World War Two Sunderland crews. No. 10 Squadron, Royal Australian Air Force was the only Australian squadron to serve continuously for the duration of the Second World War in Europe. Formed at Point Cook on 1 July 1939, 10 Squadron was initially equipped with a motley collection of seaplanes with the intention that these would shortly be replaced with six new Shorts Sunderland flying boats. At the end of July 1939 a small group of squadron personnel proceeded to the United Kingdom for training on the new aircraft which, it was planned, they would then fly back to Australia. While these personnel were in Britain the Second World War was declared and on 7 October 1939 the Australian Government ordered the squadron to remain there to assist the British war effort. The above Flag was flown by 10 Squadron RAAF Sunderland RB-W when in overseas ports. The aircraft destroyed one U-boat and damaged another. In 1942 flying boat RB-W transported Lord Gort VC with the George Cross awarded by King George VI to the besieged island of Malta.